Keynote is a presentation tool for Mac. It’s very beautiful, dynamic and practical. It is possible to work online and offline on iPad and iPhone. Keynote is easy for producing and delivering beautiful presentation. Powerful tools and amazing effects enables the presentation of your ideas in the best possible way. Preview bundle and download here. ECO Keynote Presentation has 100+ slides of content (vector handmade infographic, portfolio, data charts, section breaks, maps, title slides, general information, globes, tables, timeline, marketing scheme, calendar, illustrations) in 3 different formats (16:9, 4:3, A4). It includes 10 amazing color variations as well as print ready format. Download only this template. This is a handcrafted template which is not based on Master Slides. It contains 60+ presentation slides, premium animation and many more. Download only this template. Some features: 60+ UNIQUE Slides. Custom Animations and Transitions. Easily Editable. 16:9 HD & 4:3 Slide Format. Many Icons and infographic elements Included in the Presentation. Map World, USA, Canada. Free font used. This is premium Keynote template with over 150 unique slides (basic page, portfolios, project page, data charts, infographic, section breaks, tables, pricing tables, timeline and more). It is also handcrafted, not based on Master Slides. It comes in 2 different formats (16:9, 4:3), with 30 premium color variations, and it isfully editable and customizable. Download only this template. Some features: Total 18.000 slides. Custom Animations and Transitions. Easily Editable: Full Shape. 16:9 HD & 4:3 Slide Format. Many Icons and infographic elements Included in the Presentation. Shape Map World, USA, Canada, Globes, EU (European Union Map) & 27 shape country flags. KeyNote Mock-up Phone (3 colour). NO Photoshop needed. 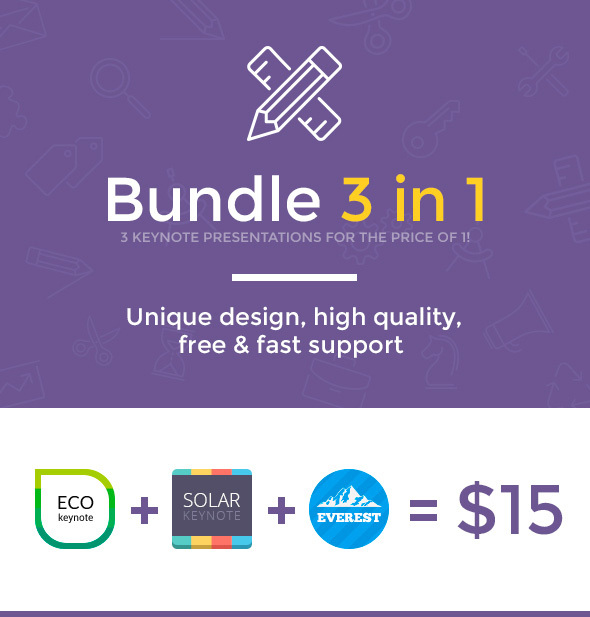 If you like this amazing Keynote presentation template bundle, you can download it here.